In Brief: A relatively easy hike along an unrestored section of the Great Wall that grants magnificent views of the Great Wall stretching beyond the horizon in the east and west. Hiking past a large tower on the Gubeikou Great Wall. 3–4 hours start to finish over 6–8km. On this hike we’ll walk a picturesque section of wall that offers great views without too much hard work. As we follow the wall, we’ll pass through restored and unrestored sections, as well as taking a scenic detour through pines on a hillside trail. We’ll start the walk with a short climb up to a dirt trail to reach the wall. Once we’re up, we’ll be able to see the roofs of a small town; past those, the old highway to Chengde; and even further, a stretch of Great Wall climbing a steep ridge. Continuing along the wall, we’ll pass through a lot of towers – some in good condition, some tumbled down to foundations only. Excluding one detour, we’ll be able to walk on the wall just about all the way, climbing up, over, and down the hills and ridges. The detour comes about thirty minutes into the hike, and takes us along a path through a pine forest and then up a dirt trail to get back to the wall - about 15 minutes all up. After the detour we’ll be back on the wall, and will continue along it, passing through towers and climbing up and down moderately steep sections. Some of the towers we visit are ruined, with only walls left. Others are in very good condition, and we can climb up on top for even better views of the surrounding area. The wall in this area is built on ridges, and because there are not many trees on the ridgelines we will have broad views in every direction as we walk. We’ll have the option to extend the walk a bit by continuing past the last tower on the loop, heading on a little way towards Jinshanling before turning back. After we finish the hike we’ll have a late lunch at one of the restaurants at Gubeikou – the cost of the food and drinks is included in the price of the hike. 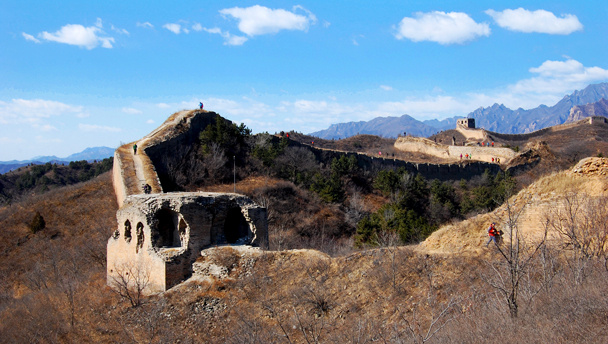 Clear skies made for awesome long views at the Gubeikou Great Wall—see 31 photos from the hike. We made it all the way up to the 24-Eyes Tower at Gubeikou on this hike—take a look at 17 photos a day out on the Great Wall. See ten photos from a hike at the Gubeikou Great Wall. See 23 photos from a chilly day out at the Gubeikou Great Wall Loop. We had the wall to ourselves on a clear day out at Gubeikou—see 15 photos. We hiked through all the autumn colours on the Great Wall at Gubeikou—see a set of 25 photos from two of our recent walks at Gubeikou. See 17 photos from the a hike at the Gubeikou Great Wall, under a big blue sky. The weather was pretty much perfect for this hike at the Gubeikou Great Wall, with clear air and blue skies—see 21 photos. 31 photos from the Gubeikou Great Wall Loop hike. A super set of photos from an excellent blue sky walk on the Great Wall at Gubeikou—se 50+ shots of hikers, wall, and more scenery. On this visit to the Gubeikou Great Wall we started seeing signs of spring in the hills, with buds and blooms all through the hills around the wall—see 20 photos. A set of 20 photos from a cold and cloudy hike at the Gubeikou Great Wall. See 20+ photos from the Gubeikou Great Wall—clear skies and awesome views of the wall and mountains for our first hike of 2018. See photos from a two-day team trip to the Gubeikou Great Wall: Hiking, paper cutting lessons, overnight in a lovely guesthouse … nice! 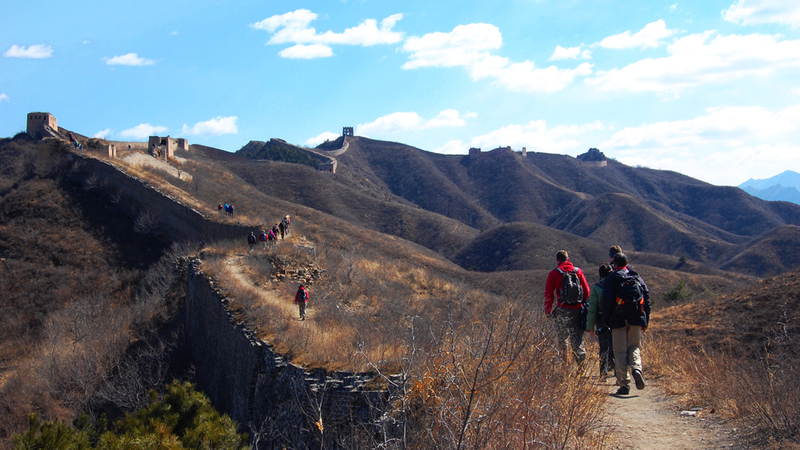 Blue skies and warm sunshine—take a look at our favorite photos from the Gubeikou Great Wall Loop hike! See 40 photos from the Gubeikou Great Wall Loop hike, showing the scenery of late September. See a set of ten photos from a walk on the Great Wall at Gubeikou on a day that went from rainy to clear. Fifteen photos from a walk along the Gubeikou Great Wall. Sometimes the weather is just perfect for hiking. On this hike on the Gubeikou Great Wall we had beautiful blue skies and awesome views of the wall. Photos from a Great Wall hike organised for the students at Beijing’s Beanstalk International Bilingual School. Fifteen photos from a walk along the Gubeikou Great Wall on a beautiful blue sky day. Photos from our hike along the Great Wall at Gubeikou during the Mid-Autumn Festival holiday. Photos from our Gubeikou Great Wall hike, and the post-hike dumpling-making competition. Photos from a walk along the Gubeikou Great Wall. This hike is a variation on the famous Gubeikou to Jinshanling hike, but which loops around to end at the starting place. It’s on an unrestored section of Great Wall and as such, tends to get less traffic than recently renovated sections of the Wall. Click through for photos.